Traditional tattoo artist Hovak Johnston will spend over a week in the hamlet of just over 400, one year after she brought the Inuit Tattoo Revitalization Project to Kugluktuk. 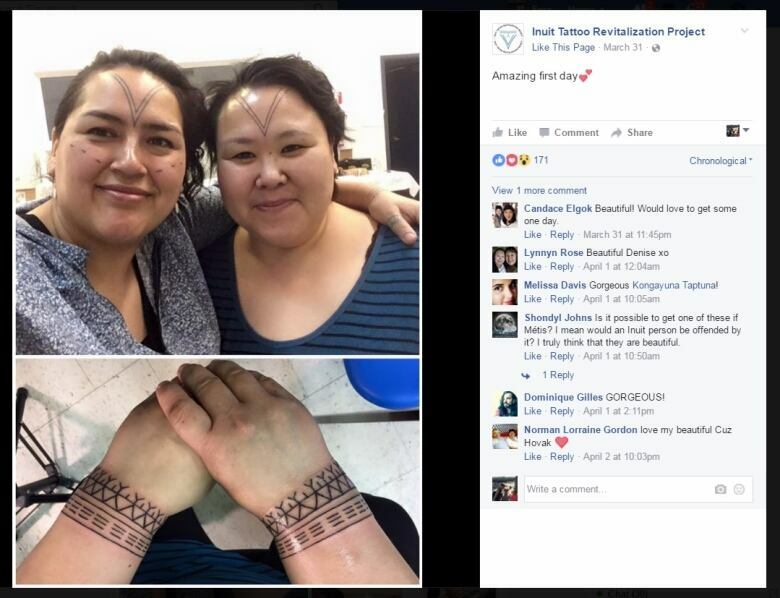 After eight months of planning, Hovak Johnston has been able to bring the Inuit Tattoo Revitalization Project to Ulukhaktok, N.W.T. "The oldest woman that I tattooed, she was 73 years old, and it's so powerful," she said. "I've had so many tears already." Johnston arrived Friday and will be in the hamlet of just over 400 people for more than a week, one year after she brought the Inuit Tattoo Revitalization Project to Kugluktuk. The goal is to bring back a tradition that had nearly become "extinct" in the Inuit culture. "It hadn't been practiced in three generations," said Johnston. Johnston spent about nine years learning the art of traditional tattooing. She arrived in the community with another tattoo artist from Yellowknife as well as a videographer and photographer. The goal is to do as many tattoos as possible, for anyone who wants them. In all, the trip cost around $70,000. Money was raised from sponsors like Tides Canada and the hamlet, as well as individual community members. "There was so much interest and people willing to help," she said. So far, Johnston has tattooed 17 women — five of them with facial tattoos. "It's getting the young and the old talking about a tradition that was not talked about for a very long time and with these young people, getting a chance to learn about markings they never had a chance to ask about before," said Johnston. "It's not just tattooing them, not just putting ink in them. There's so much healing going on." Some of the women being tattooed are repeat customers. Julia Ogina was one of the women that Johnston first tattooed last year. "My dad encouraged me over the years to get my great grandmother's tattoos. It was something that very few people or nobody did," Ogina said. The 54-year-old has now been able to get tattoos on her chin, cheeks and wrists. She's also helping Johnston interpret the tattoos other women are getting, which vary from region to region. Ogina describes it as helping the women "finding their stories and finding their symbols." "We've had a mother and daughter coming, mother and grandmother coming in. It's very enriching even for the elders to remember. It allows them to remember their own childhood and memories they thought they'd forgotten." While in the community, Johnston is on the lookout for anyone who wants to learn and pass on the tradition. She's giving presentations at the school as well as documenting her trip. She plans to return in May for touch-ups, and to present a series of outdoor billboards with photos of the tattoos taken on this trip. "I'd like to have outdoor billboards to go around the community so that the women will remember this day and the community will have something to talk about when they see the billboards." Johnston leaves April 11. A feast and celebration is planned for April 10.